What a lot has happened over the past few weeks! We all went on holiday to Italy, which ought to have been heavenly – I was envisioning a kind of Enchanted April situation, with the addition of a rather squidgy Vita sitting in the shade making sweet gurgling noises – but alas it was broilingly hot, we had a laughably terrible journey, a scorpion took to sauntering around Vita’s cot, she got horribly, worryingly ill with tonsillitis so none of us slept for days as she cried rather heartbreakingly pathetically all night, and, the last straw, I trod on a wasp. We came home early, all absolute wrecks, and were put back together again by a combination of mothers, doctors, and antibiotics. Emilybooks has resolved that from 2016, we will adopt a strict policy of staycationing during the summer months. On the up side, as we came home early, I was around and able to write this big feature about the controversial new Harper Lee book, Go Set a Watchman for the Daily Mail. 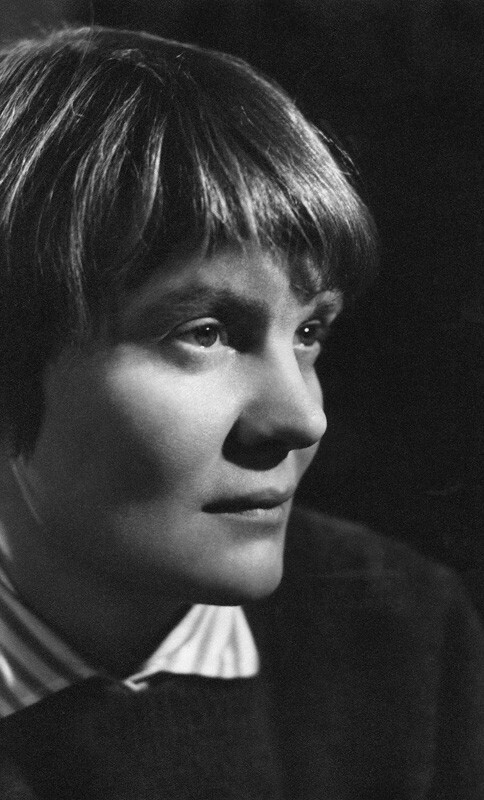 The Bell by Iris Murdoch was mostly read while I was covered in Vita-vom, with eyes propped open with matchsticks, yet, still, it was a triumph. It is a shame that Iris Murdoch has fallen so out of fashion. 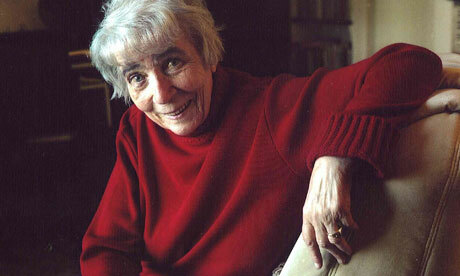 She tends to be dismissed as someone who created ‘novels of ideas’. Such an idiotic phrase! Aren’t all novels filled with ideas? And, surely, it ought to be a compliment in any case? Well The Bell is bursting with ideas, and, the conclusion from yesterday’s walking book club is that we could have done with another few hours to discuss them all – so much was there to say. Murdoch gives us a rich assortment of characters in her community. Different chapters are focalised through the viewpoints of Dora, Toby and Michael. Michael is one of the leaders of the community and is struggling to come to terms with his homosexuality. There are also several others – including the mysterious Catherine, who is to become a nun; her brother Nick, a depressive drunk who Michael used to teach and with whom he was – perhaps still is – in love; busybody Mrs Mark, naturalist Peter, charismatic James Tayper Pace … and a few more. Very cleverly, Murdoch never gives us the perspective of these characters: they are closed, seen only through the eyes of Dora, Toby or Michael. This means that when dramatic things happen late in the book to Nick and to Catherine (I won’t spoil it for you), they come as a complete shock and cast a new light on what has come before. It is perhaps a warning about the subjectivity of experience. It is certainly a means of showing us how very separate and enclosed are her characters’ different perspectives on the world. Eliot essentially suggests that each character in a novel is like the ‘little sun’ of a candle flame, making the chaos of scratches appear to align concentrically around it – as events can seem to align around one character; but if seen from another character’s point of view, the events all line up completely differently. 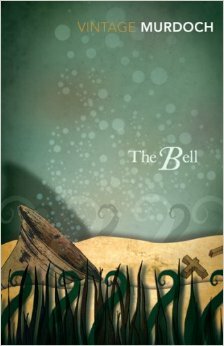 The Bell is, to my mind, a novel which shows this phenomenon better than any other – each character has such a particular, different take on events, and Murdoch’s clever way of showing us into the minds of three of them, and not into the minds of the others, allows her to pull it off with great panache. He stood, poised on the brink, looking down. The centre of the lake was glittering, colourlessly brilliant, but along the edge the green banks could be seen reflected and the blue sky, the colours clear yet strangely altered into the colours of a dimmer and more obscure world: the charm of swimming in still waters, that sense of passing through the looking-glass, of disturbing and yet entering that other scene that grows out of the roots of this one. Toby took a step or two and hurled himself in. Toby seems to keep on hurling himself through barriers into enclosed spaces, other worlds. There is another moment when he climbs over the Abbey wall; there are his forays into the different worlds of homosexuality and heterosexuality, and the latter even takes him into the cavernous bell itself (you have to read the book really for that to make sense). All these little worlds alongside each other is perhaps why sound plays such a strong part in The Bell. Birdsong, the Bach gramophone recital, singing the madrigals, the dreadful portentous bark of a dog at the end, and the great tolling of the bell – Murdoch conjures Imber as much through its sounds as anything else. Not only does this appeal to our aural sense make Imber all the more vivid, but Murdoch’s use of sound is pertinent because sound is something that can surmount barriers, can cross between the worlds: you can’t see what’s behind a wall, but you can hear what’s behind it. When Dora rings the bell, everyone is summoned, from all their different enclosures, and the following day hundreds of people are there to witness the bell ceremony. Sound is a great unifier in this novel of so many separations. There is much more, but I think I must leave it there or risk droning on for too long. Suffice to say The Bell is just brilliant. It may feel quite dated, but it also is funny, clever, thoughtful and eccentric. I can see why many people say this is their favourite of Iris Murdoch’s books. Though if I were to be completely honest, love it though I did, my all time favourite has got to be Iris Murdoch’s first novel – also funny, clever, thoughtful and eccentric, but more picaresque and very Londony – Under the Net. Some of you might remember my passing through Ferrara a few months ago, at the end of the Italian adventures of Emilybooks. I say passing through because we literally parked the car (rather too far out of the centre thanks to my misunderstanding of the map’s scale), walked up the main street which stretched on and on and on, reached a castle, turned right, saw the Palazzo dei Diamante (thank you architect husband), dunked my head in a fountain, ate two ice creams, and then returned to the car via a prettier windier route, and drove onwards to Vicenza. 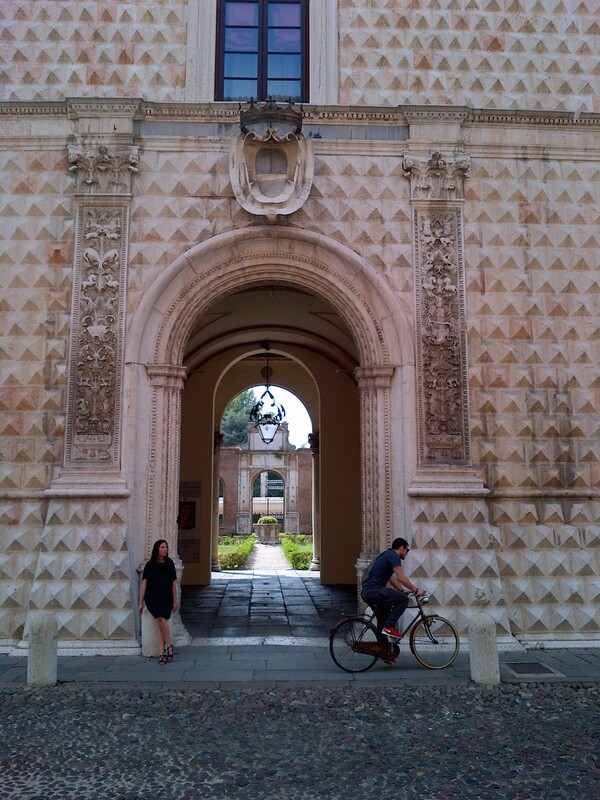 I wish we had stayed a little longer, but we had to get to Vicenza in time to meet our Air BnB host. I was so excruciatingly hot that all I can really remember from our couple of hours in Ferrara was the sudden joy of having my head covered in cold fountain water, vastly overriding any embarrassment caused by the amused looks we got from nearby Italians. I wished we had stayed longer as I love the work of Giorgio Bassani, who wrote some very poignant, very brilliant novels (or perhaps technically novellas) set in Ferrara, including The Garden of the Finzi-Continis and The Gold-Rimmed Spectacles, which I’ve written about here and here. And now I wish we had stayed longer because just around the corner from the Palazzo dei Diamante is the Palazzo Schifanoia where I have just learned there are some extraordinary frescos by Francesco del Cossa. 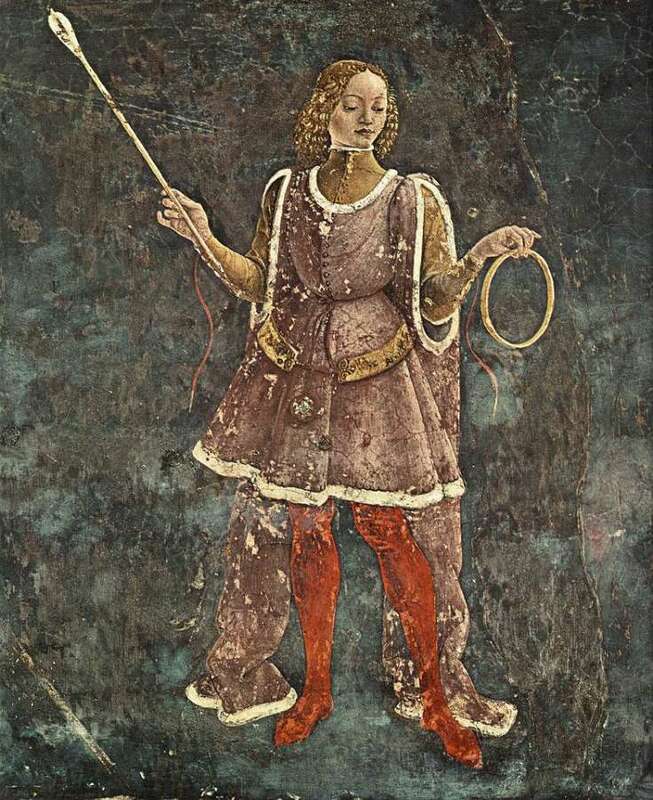 Frescos so extraordinary that one of the main characters in Ali Smith’s staggeringly brilliant new novel How to be Both goes all the way to Ferrara with her Mum just to see these paintings, and the other main character is Francesco del Cossa the artist. How could I have missed them?! At least I haven’t missed the book. What a book! You must all read it. It must win the Booker. But how on earth to begin to write about it? which Smith rails against in her previous book Artful. Forster points out that prose must be one word after another, but with this trick the words come simultaneously before and after. It just depends on which copy you pick up. So, let’s pause to reflect for a moment about how clever someone is who can write two halves of a novel, twist them around each other with connections and parallels and then engineer the plot to work both ways you encounter them. Right. And let’s not dismiss it as a gimmick, because really it is a signposting of Smith’s ongoing attempt to push at the very boundaries of what fiction can achieve, how narrative linearity can be bent and played with, made pliant to her demands. 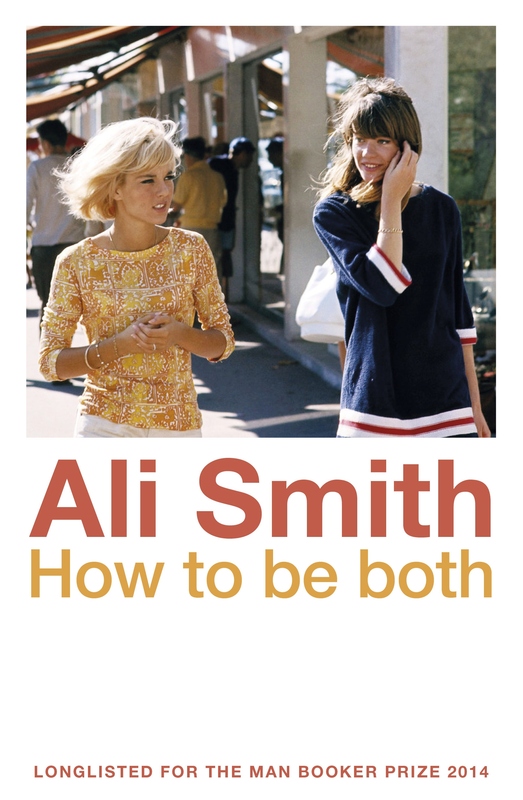 The thing about Ali Smith’s writing is that it’s always very clever, but never at the expense of the work itself. You don’t pick up the book and think Christ what a smart-arse. And, frankly, you might be forgiven for anticipating such a reaction. I mean, what if you just want to read an enjoyable novel but instead find yourself landed with some extraordinarily clever modernist work which grapples with huge questions of form and gender and linearity, striving for a unique and wonderful ‘bothness’ which has never before been achieved. You could be forgiven for feeling somewhat put out by having bitten off more than you’d bargained for. But Smith’s prose is so alive, vivid, enthusiastic, energetic and engrossing, dancing with possibilities, that within a page or two you forget that you’re reading a great modernist challenge, and are every bit as caught up in the pleasure of the story as you might be in a more straightforward novel. There are moments when the bright ideas leap out at you, but they never pull the fabric of the story too far out of shape. She has it both ways. So, back to Forster’s assertion and Smith’s tackling of it. How then can a novelist deny time and its linearity? Aside from publishing two different versions at once. She sits down on the floor, leans back against her own bed and eats the toast. It’s so boring, she says in Italy in the palazzo in the mock-child voice they always use for this game. Just like that, from one sentence to the next, we are transported back in time to when George and her mother are in Ferrara. This really happened, George said. To this girl. And anyone can just watch it just, like, happening, any time he or she likes. And it happens for the first time, over and over again, every time someone who hasn’t seen it before clicks on it and watches it. So I want to watch it for a completely different reason. Because my completely different watching of it goes some way to acknowledging all of that to this girl. But which came first? her mother says. The chicken or the egg? The picture underneath or the picture on the surface? The picture below came first, George says. Because it was done first. But the first thing we see, her mother said, and most times the only thing we see, is the one on the surface. So does that mean it comes first after all? And does that mean that the other picture, if we don’t know about it, may as well not exist? Again and again, we are asked to question which came first, what keeps coming, looking at the limits of time, and how they might be overcome. He’d speak like from another time … He’d say things like ho, or gadzooks, or egad … He’d be like an exchange student, not just from another country but from another time. She thinks how typical it’d be. You’d need your own dead person to come back from the dead. You’d be waiting and waiting for that person to come back. But instead of the person you needed you’d get some dead renaissance painter going on and on about himself and his work and it’d be someone you knew nothing about and that’d be meant to teach you empathy, would it? It’s exactly the kind of stunt her mother would pull. For alongside this preoccupation with cheating time and its insistent linearity, comes cheating death – the ending of someone’s time. Perhaps above all How to be Both probes the way that the dead and living exist alongside each other, overcoming their obvious beginnings and endings and times. In the other part of the novel, Francesco del Cossa comes back from the dead. The artist has a peculiar invisible connection with George, watching over her, involuntarily following her about as though attached by a rope. Looking back at George’s musings above, one wonders, is this indeed the kind of stunt her mother would pull from the dead? Or perhaps this is George’s empathy project for school writ large. For How to be Both is a startling exercise in empathy – a rendering of this silent strange connection between two people separated by hundreds of years and thousands of miles. to amplify experience and extend our contact with our fellow-men beyond the bounds of our personal lot. Well then, How to be Both is a giddy, dizzying, mesmerising piece of art. Read it and I dare you to disagree. A couple of months ago I wrote a piece for the Spectator Books blog about how one ought – or, indeed, ought not – to arrange one’s bookshelves. I revealed the scintillating news that many of my books are arranged as though they are at a huge literary party: I think of which characters might get on with characters in other books and put them next to each other. 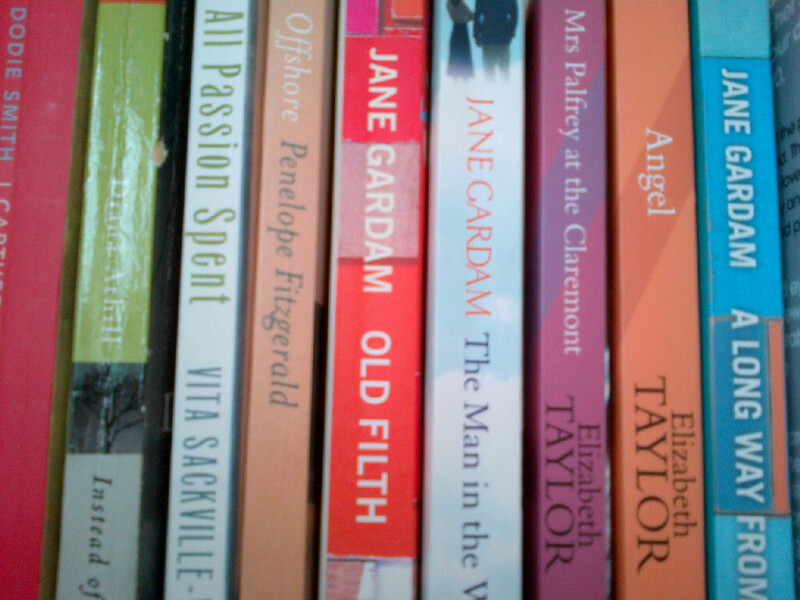 So, for instance, Old Filth by Jane Gardam is next to Offshore by Penelope Fitzgerald because I think that Eddie Feathers (a.k.a. Filth) would get on well with Richard from Offshore. On Offshore’s other side is Vita Sackville-West’s All Passion Spent – while Lady Slane might not entirely approve of Offshore’s Nenna, I feel sure that she’d sympathise with her, as they both defy their family in choosing where to live, be that in a small house in Hampstead or on a rickety boat on Battersea Reach. Knowing what a bore it can be to get stuck with someone and unable to shake them off for hours at a party, I shuffle the books around now and again. I’m sure that Mrs Dalloway would approve. 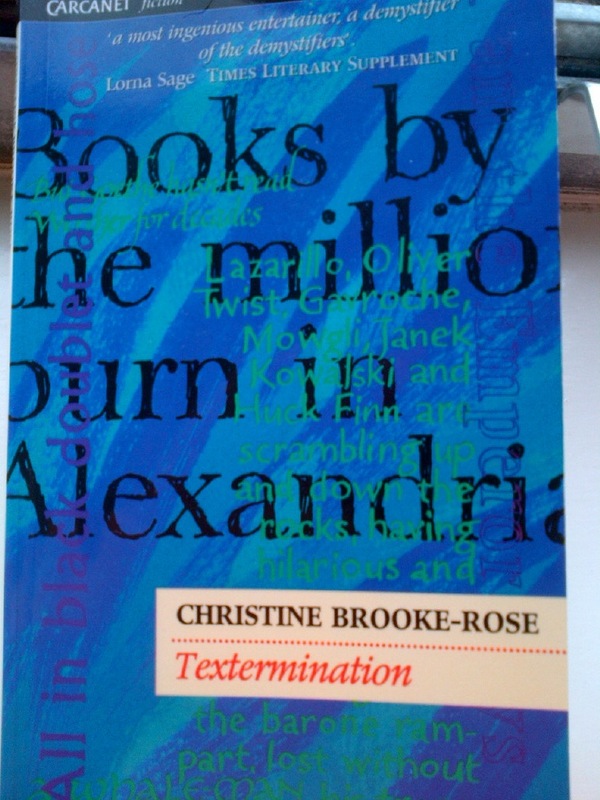 Given this somewhat eccentric means of arrangement, which would, no doubt, be the bane of any librarian’s well-ordered system, I was delighted to read Textermination by Christine Brooke-Rose, a novel about just this sort of literary party. What a strange country America is, says Becky Sharp to her neighbour Friday, who grins and says island, very big. Lazarillo, Oliver Twist, Gavroche, Mowgli, Janek Kowalksi and Huck Finn are scrambling up and down the rocks, having hilarious and noisy fun. Lotte looks as ever for Goethe but finds herself instead with a Dublin Jew called Leopold Bloom, who talks a great deal but of things quite beyond her ken, except when he describes the preparation and eating of fried kidneys. Ugh! She barely has time to glance at the cards, and to her horror she doesn’t recognise every name … Who was Charlotte Kestner, for instance, out of Thomas Mann? Who was the handsome young Indian labelled Aziz? Or a splendid Arab king of Granada labelled Aben-Hamet, or even Philip II out of she didn’t see who? Those at least she should have known. She feels ashamed and rattled. Gaps, so many gaps in her reading, she’ll never catch up. ‘So many gaps….’ This worry of never managing to catch up is the reader’s perennial complaint. It is only made worse by the fact that the more you read, the more you discover there is still to read. The huge crowds at this convention at the San Francisco Hilton suggest the impossibility of being able to read everything – it’s too overwhelming, you will never catch up. I believe it comes to the same thing you know, says Strether, it is my viewpoint throughout. Serials come off the air and sometimes return. But more often they do not. Dallas, for instance, which ran for two decades or more, has been axed. And then we’re deader in the short public memory than anyone in a book. It is a comical and dramatic way of staging a good question: which characters are more real – those on television or those in a book? It is just one of many pert questions about literature and the value of it that Brooke-Rose asks, masked in her riotously imaginative set-up. You can perhaps imagine the confusion when film adaptations of characters meet their literary originals. Textermination reminded me of the reader’s responsibility to read widely and to read well. Brooke-Rose conjures a great deal of pathos for her characters, all neurotically shuffling around the Hilton praying for their survival. Only we – the readers – can grant this to them. We think, therefore they are. ‘So many gaps’, thinks the reader, but this book should encourage us to keep on trying to fill those gaps, to continue to explore all these brilliant books, to not be cowed but inspired by the wealth of literature that lies ahead of us. Textermination serves both as a welcome reminder of some of our favourites and a tantalising introduction to the literary treasures that we’ve yet to read. In adopting all these characters from other novels, Brooke-Rose deliberately draws attention to herself as a reader as well as a writer. We should be inspired by her example and use our own readerly powers to keep the characters alive. As well as overcoming all the obstacles and challenges which the convention comes up against – from terrorist attack to blazing inferno – the characters have all survived their authors. Sadly, Christine Brooke-Rose passed away last year, making her the second author (at least) that most of these characters have outlived. Perhaps they are kind enough to pass a little of their immortality on to their writers. Certainly the characters in Textermination conjure a woman of brilliant intelligence, with a wonderfully mischievous imagination, who was also a voracious reader. Inspiration for us all. The weekend’s Guardian review featured an illuminating article on various author’s favourite holiday reads. I was struck by how few of these memorable experiences offered any relationship between book and place. Yes, Jonathan Raban relished reading Death in Venice several times over when in Venice and John Banville loved reading The Portrait of a Lady in Florence (even though the coincidence of the book’s setting and his holiday location was purely accidental), but they are pretty much the only ones of the bunch. Whenever I looked up from the page, I saw the ruins of Odysseus’s palace (so called), the beach where he eventually made landfall, the empty cave where his cult once thrived, the bare rocky hills described in the poem – and also saw myth and reality tumbling through one another. Reading a book in its natural setting can be a truly magical experience. I first came upon this realisation by going about it the wrong way round. In my GAP year, I spent a few months in Nepal, nominally teaching in a village primary school, but, as the school kept declaring impromptu holidays and the working day in any case was over by 5ish, when I returned to my room in a Nepali family home, I had rather a lot of time on my hands. Luckily I’d had the foresight to ask for the Oxford English reading list before heading off, so the long evenings were easily filled by working my way through the Victorian canon. 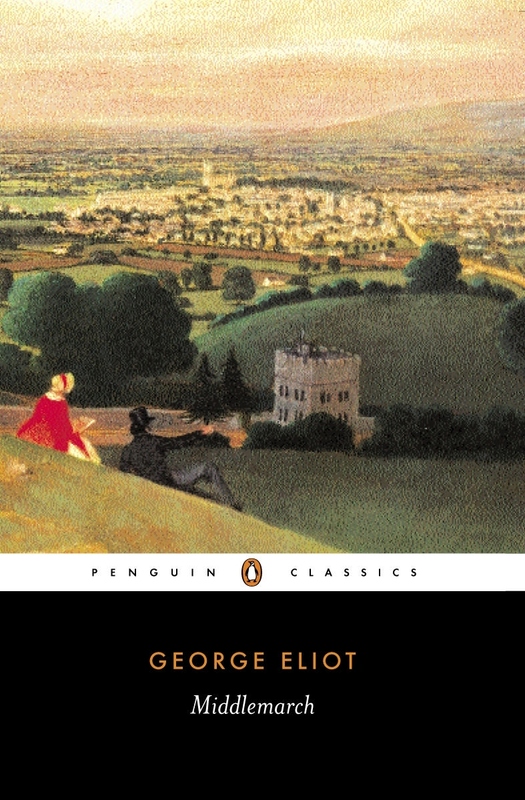 There were a few weeks of Eliot – Middlemarch, The Mill on the Floss, Daniel Deronda; then of Dickens – Bleak House, Oliver Twist, Great Expectations, The Pickwick Papers; the Brontes were over in a flash, but Vanity Fair took a little while. All this was punctuated by the odd bit of Browning and Tennyson. I remember feeling absurdly reckless when I put down the Victorians for a week to read Satre on a friend’s recommendation. Reading all these English classics so relentlessly in a dim, grubby room in Nepal, enclosed in a sleeping bag and having to swap book-holding hands periodically due to the cold biting at my fingers, was deeply strange. There I was, supposedly finding myself, somewhere unlike anywhere I’d ever been before, and I was accompanied by the faintly nauseating voice of Bleak House’s Esther or earnest Jane Eyre – the latter, comfortingly familiar from when I’d read it a few years previously. I spent the weekends wandering around breathtaking stupas and temples, like Boudhanath and Swayambhunath (Kathmandu’s ‘Monkey Temple’), yet my reading material was based in nineteenth-century London or the English countryside. I remember being on a bus heading down to Pokhara for a trek to Annapurna base camp, trying to concentrate on Bleak House in spite of the bumpy roads, when an American lady asked me why on earth I was reading it. ‘Got to get through my university reading list,’ I explained, a bit puzzled as to why she found it so odd. Until that point, it really hadn’t occurred to me that it made sense to read a book – other than the omnipresent, omniscient Lonely Planet – about Nepal. Luckily it wasn’t long before I spent a couple of weeks in a Buddhist monastery, from which I emerged wanting only to read books written by the Dalai Lama and The Tibetan Book of Living and Dying. Oh, and (shamefully) The Alchemist came a few week’s later. I don’t mean Ben Johnson’s. There was undoubtedly something truly special about the way in which those Victorian classics transported me back to England, about how they absorbed my imagination so fully that I really could have been reading them anywhere – that I was in a smelly sleeping bag in a Nepali village couldn’t have mattered less. But I can’t help but feel that reading some books from the subcontinent would have been even more special. Ironically, when I finally went up to Oxford, a few months later, struck low by a bug in third week and panicking at all the reading still to do, I decided to read Kipling, thinking that The Just So Stories might be comforting for the sickbed. I zipped through them and The Jungle Books, and was on to Kim by the second day. There I was, lying in my duveted single bed in one of the most English places in England, eating toast and drinking tea, reading all about a young boy scampering through Lahore. Although I’ve never been to Pakistan (although back then, of course, it was India), it took me straight back to my time in Nepal. There followed my best essay of the term. A couple of years later I returned, not to Nepal this time, but to India. As soon as I landed in Delhi, I bought a copy of Salman Rushdie’s Midnight’s Children, much to the Indian bookseller’s delight. Ok, I wasn’t in Bombay, but I was at least in India, and this was the perfect chutnied, chaotic, polyphonic accompaniment. Since then, I’ve tried to match, more-or-less, book to place. Last year’s holiday to Italy, for instance, was perfectly matched with Bassani’s The Garden of the Finzi-Continis and Forster’s Where Angel’s Fear to Tread. I’ve written elsewhere about Forster’s powerful use of landscape and setting, and it was remarkable to be reading about Gino’s sultry and indolent loggia and then to look up and see one. The previous year’s trip around Japan was accompanied by Mishima, Soseki, Kawabata and, of course, Murukami. How incredible to be in Kyoto while reading The Temple of the Golden Pavilion! How glorious to be in Tokyo and to read Kokoro, set in the same city, a hundred years ago! Perhaps it’s for the same reason that, when I’m not on holiday, but getting on with life in London, I particularly enjoy books in which London has a strong presence – from Maggie O’Farrell’s The Hand that First Held Mine, which I polished off in about three days straight last week, to Muriel Spark’s A Far Cry from Kensington, and from Iain Sinclair’s Hackney to Richard Mabey’s The Unofficial Countryside. Reading these books when in the right place, makes me feel even more there, even more part of London, or Tokyo or Tuscany. It acts as another layer of absorption – not only is everything one actually sees belonging to that place, but everything one sees in one’s mind eye belongs there too. Next week, when I’ll be on holiday in the Outer Hebrides – so you might have to wait a couple of weeks for the next post, I’m afraid – I’ll take Gavin Maxwell’s Ring of Bright Water, which takes place on the remote West Coast of Scotland and is heralded as one of the greatest pieces of nature writing of all time. I might also take some Robert Burns, possibly a copy of Macbeth, perhaps something by Sir Walter Scott. And I shall definitely take the rather majestic Lore of Scotland, a comprehensive guide to Scottish myths and legends, which pinpoints each one to a place. I will keep an eye out for selkies. I suspect they might be easier to spot after a few whiskies. Time for episode two in the series – D,E, and F.
‘Dahl for D’, someone commented on the first installation of this literary A-Z. But what about Dickens, eh? Or Dalrymple? Or Dostoevsky? Or, for that matter, Donne? D seems to have particularly rich pickings. No matter how you spin it … Roald Dahl was an absolute sod. Crashing through life like a big, bad child he managed to alienate pretty much everyone he ever met with his grandiosity, dishonesty and spite. In light of the stiff competition, perhaps this nastiness is reason enough to put Dahl to one side. William Dalrymple is in the shortlist because his book From the Holy Mountain was the first piece of travel writing I read. A friend at school gave me a copy and I was absolutely blown away by it. It also meant that I spent most of my GAP year writing a journal in a rather overblown literary style. I think that luckily it’s now got lost somewhere. Dostoevsky, yes he’s good, but, personally, I never get on as well with the Russians as I’d like. The writers that is, not the people. Some of my best friends are Russian. So D, when scrutinised a little more rigorously, comes down to Dickens versus Donne. It’s a strange clash – the master of the neverending sentence versus the master of concise imagery. And if I’m honest, and I’m a bit ashamed of this soppiness, I’ve got to choose Donne, because, to my mind, he writes about love better than anyone else. ‘My face in thine eye, thine in mine appears,’ from ‘The Good Morrow’ is beautiful and perfect. It can’t be beaten. I’ll cut to the chase here. Eliot versus Eliot. Another case of novelist versus poet. George versus T.S. Will not a tiny speck very close to our vision blot out the glory of the world, and leave only a margin by which we see the blot? Clever lady. And great plots too. And he scowled upon a hostile world from one forbidding eye. But enough deliberating … I’m going for George Eliot. Just because I think it would be wrong not to. F is obviously Forster. But I shall swiftly mention some other excellent Fs too: Fitzgerald, Flaubert, Fanon, Faulkner. Now back to Forster. Forster is possibly my favourite writer. Full stop. I think he is a genius. His novels are a perfect mixture of neat, satisfying plot and meaty ideas. He is very good at writing about the English. Especially the English abroad. How do the English respond to a different country, to a different landscape? (I wrote about his use of landscape here.) And how do English good intentions make everyone else suffer? One may as well begin with Helen’s letters to her sister. If you haven’t read any Forster, well one may as well begin with Howards End.